If you had told me that I would have a morning routine that involved getting up before the sun a year ago, I would have laughed and said no. I kid you not; I used to have a 7:10 AM alarm that I would snooze until 7:30 am when it was bright and sunny out. Waking up is the most terrible part of the day for me, and now, there’s a baby added in. Not only do I have to take care of Cannon but I have a dog and no backyard. No complaints though — these are all of my responsibilities, and I got this. 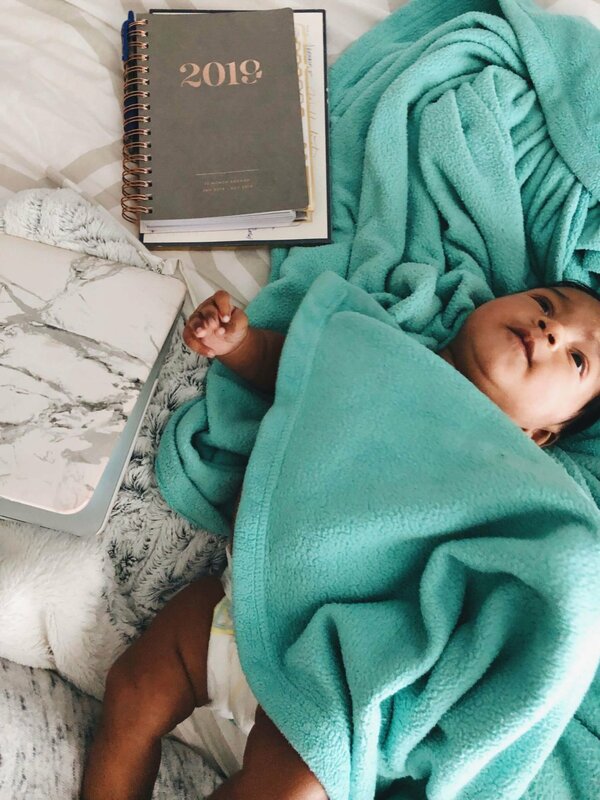 The two months of maternity leave that I had spoiled me. I could sleep in whenever Cannon slept in, and I just stayed in bed all day long. It sounds lazy, but it was nice especially with a newborn that woke up every 2-3 hours to eat and be held. Going back to work had to be easy and put together. I had to modify my routine so that I would have tons of time to get things done. For the most part, I solo parent as my boyfriend works a different schedule and plays football, so he has to leave for training. This is why a morning routine has been so important to me — a routine, in general, has been a blessing. Ultimately, I’ve learned to lower my exceptions of the things I can accomplish for the day. There are days when I’m a super mom because Cannon will nap and I can do so much. And there are days where all I do is feed, change, and hold Cannon. At the end of each day, all that I do is enough. As a mom, we have a lot on our plates. Here are a few tips to make life a little less stressful and what to include in your morning routine. This is the first thing I learned my first week back to work. You need to be the first one up so that you can knock the morning things out before dealing with kids. Take this time to walk to the dog or let the dog out, make a smoothie, brush your teeth, style your hair, etc. With a good 30 minutes before waking up Cannon, I can get my make-up & hair done and get dressed. It took some tweaking, but I’m able to get my adult things done before waking my baby. I find that waking up on your circumstances gives you the time to do what you need to do. When the baby doesn’t wake me up, I get a lot done which surprises people. This is a need for your routine. Yes, this is the key to a great morning and your life. If you organize the night before you will find that you have less to do in the morning. Once I get Cannon down for the night, I sneak back downstairs to clean up the kitchen, clean & prepared his bottles for daycare, restock his daycare diaper bag, and lay out clothes for the next day. It might seem like a lot, but I have to do all of these things to make sure it gets done without rushing. Try this out for a week, and you will see all that you can get done. I have about forty extra minutes in the morning after I get Cannon ready because I have everything together. If I didn’t do this, each morning would consist of a lot of running around, and I would unravel. Many people panic when their situations don’t turn out how they expect. I was one of those people that would stress and stress if we weren’t ready by a certain time and if we held people up. I wanted to be on time, and I tried so hard to be on time, but I just couldn’t get it. And, this was to family breakfast on Sundays — Chase and I were late all the time after Cannon was born because we couldn’t just get dressed and leave like we used to. It took my parents telling me to take my time for me to stop stressing about that situation because it would just make things worse. When we stress, we are adding more to our plate, and it wears us down. Don’t do that to yourself. You’ll get there, and you might be late, but you made it. People get it if you let them know in advance. Once you let stress in, you let in feelings of being overwhelmed and not together. Stay calm and just do your thing. You’ll get to where you need to get. It’s important to get your kids accumulated to a schedule. I know most people say that a routine for baby isn’t worth it so early, but it’s worth it for the working parents. As someone that has to be at work by 9 AM, there is a lot that needs to be done for me, Cannon, and Rocko. People think it’s so easy to get a baby ready, but it’s truly not. There are so many steps that a routine is probably the best thing that has happened to my little family. By creating a routine for Cannon, he sleeps in a bit longer and wakes up in a good mood. When I didn’t have a routine, I was running around with a baby attached to me while trying to get my make-up done and find my outfit for the day. It’s hard to juggle so much. Your best interest is to do what’s best for you and what works for you. With a baby, you have a lot to do up until your child can dress themselves around four or five. 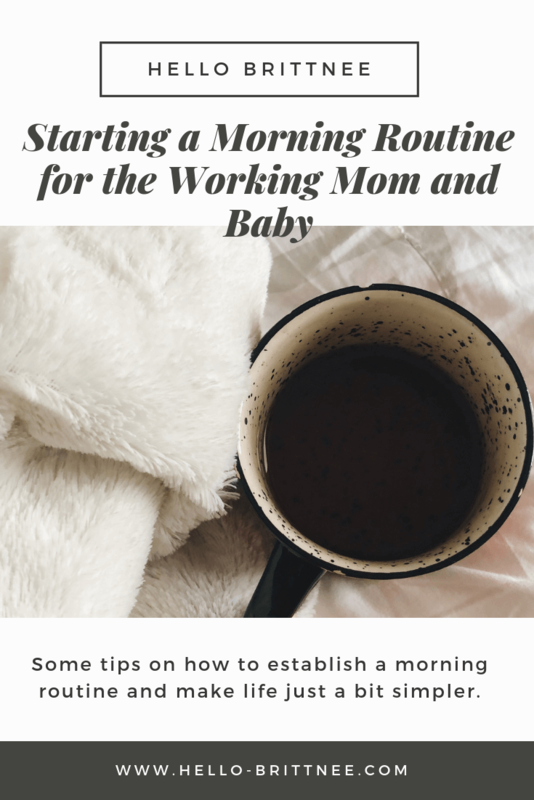 Why not implement a routine of waking, eating, diaper changes/get dressed, etc? It’s not hard, and it can roll into your routine. Just remember happy mom equals happy baby. Overall, you need to find what works for you. Maybe these tips are helpful, and maybe they aren’t, but they work for me. I realized that for me to be happy and keep my baby happy, I had to make some changes. Do I like waking up at 6:35 AM? No, I hate it, but I get so much accomplished which makes me happy. I don’t feel like I’m rushing around and don’t have time for anything. That’s what truly matters is that I found something that works for me and Cannon and Rocko. It’s hard, at first but it becomes a habit. What are your morning routine tips? Any working moms have it figured out?